It’s been a special season in the Cajundome for the UL Ragin’ Cajuns. Prior to Saturday’s surprising overtime loss to Little Rock on Senior Night, coach Bob Marlin’s team had won every home game on its way to securing the No. 1 seed in the Sun Belt Conference Tournament and regular season championship. For this sports writer, though, the top moment of the season ironically came during the halftime ceremony when my favorite all-time Ragin’ Cajun basketball player Dion Brown was recognized for his induction into the UL Athletics Hall of Fame last fall. I’ve interviewed tons of athletes during my three-decade career in this business. Usually, it’s merely another day at the office. When you get to interview one of your favorite all-time athletes from the days before it was your profession, however, it’s different. As much as you attempt to stay completely professional, the fan part comes out. Making it even better was Brown genuinely seemed to enjoy his return to Cajun Country as much as I relished the opportunity to interview him. It didn’t take very long to discover Brown and I have one thing in common: We both love reliving the great moments of his playing days at then-USL from 1980-84. “Yeah, I would have loved to play in this place, but Blackham was special,” Brown said. “When I came on my visit, I watched Dion Rainey hit a deep corner jumper to win the game against my hometown team (UAB in NIT opener). I saw the way Blackham just rocked. 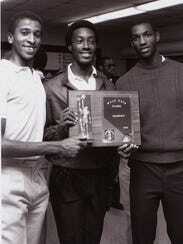 Brown arrived in Lafayette in 1980 with fellow freshmen Graylin Warner and Alonza Allen under head coach Bobby Paschal. The team barely enjoyed a winning season in its first season at 15-13, but then Brown and Company finished out their careers 24-8 (NCAA automatic bid), 22-7 (NCAA at-large bid) and 23-10 in NIT Final Four in New York City. The first game of Brown’s sophomore season was a 70-61 win over No. 5-ranked and eventual national runner-up Georgetown with Patrick Ewing on their way to winning the Great Alaskan Shootout. In his junior season, Brown and the Cajuns lost at national runner-up Phi Slamma Jamma Houston 79-78 with Akeem Olajuwon, just one Cajun jumper off the back iron at the buzzer away from beating the Cougars as well. Expecting simply a courteous, yet business-like interview, Brown was so much more. He wasn’t just saying the words, he felt the emotions of those great memories as he was relaying them. Although Brown had never returned until this weekend, he said he watches every nationally broadcasted UL game — regardless of the sport — that he can get his eyes on. He’s never forgotten where he played. These days, Brown is following his 6-foot-11 McDonald’s All-American son Jordan Brown around the country. Jordan, who made his official visit to UL this weekend, is ranked by some as the No. 15 prospect in the nation. According to 247 sports, he’s visited Cal, St. John’s and now UL with heavy interest also from Gonzaga and Nevada. Brown said he’s been blown away by the facilities on UL’s campus. “The facilities are excellent, excellent,” Brown said. “Back then, if we had all the amenities they got over here nowadays, we probably would have been national champions. We were skinny kids back then, but we were tough. When discussing his relationship with his son, Brown joked “there’s a fine line between coach and dad” as he tries to mold his son into a finished product. Indeed, Brown finished his career at UL with 1,412 points and is still No. 5 on the school’s all-time rebounding list with 926 boards. He shot 56.3 percent from the field for his career. “He’s 6-11, very skilled,” Brown said. “He can do a lot of things I could do but didn’t do. He’s actually doing them on the court. He’s got the left-hand, right-hand jump hooks — all the things you need. Those at the Cajundome aware of the Brown family’s visit might have been focusing squarely on Jordan during Saturday’s game. But the true joy for one old sports writer at least was reliving some precious memories with his dad. Click here for the Athletic Network Profile of Dion Brown, which includes the Spotlight Feature by Bruce Brown posted on the Athletic Network during December, 2017. Click here for the 1984 Men's Basketball Photo Gallery.